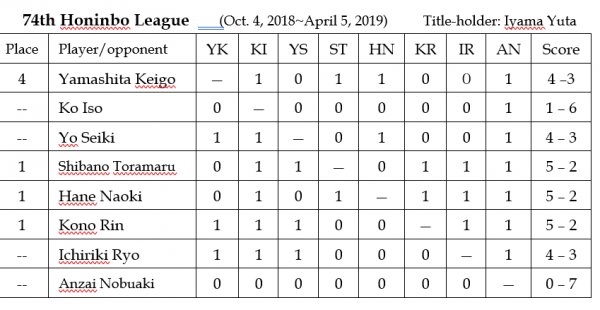 Honinbo League ends in three-way tie; playoff April 10: The big news is that there’s a three-way tie in the Honinbo League and the deciding game will be played on April 10; I’ll report the result as soon as I hear it. Here’s the result of the last game in the sixth round. On March 21, Kono Rin 9P (B) beat Yamashita Keigo 9P by resig. This was Yamashita’s third loss, so it put him out of the running to win the league. The final round of the 74th Honinbo League was played at the Nihon Ki-in in Tokyo on April 4. Following the lead of the Meijin League, all the games in this round were played on the same day. 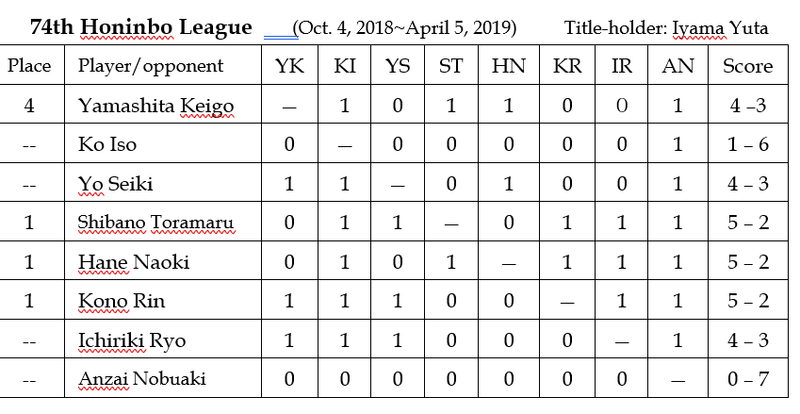 As this round started, four of the eight members of the league were still in the running to become the challenger: Hane Naoki 9P, on 5-1, and three players on 4-1, Kono Rin 9P, Ichiriki Ryo 8P, and Shibano Toramaru 7P. If he won, Hane would clinch the challengership, but if he lost there would a play-off: Kono and Ichiriki were playing each other, so there would be a least one other player on 5-2. Yamashita Keigo (B) beat Hane by resig. Shibano (W) beat Ko Iso by resig. Kono (W) beat Ichiriki by 1.5 points. Yo Seiki 8P (W) beat Anzai Nobuaki 7P by resig. The result was that Shibano, Hane, and Kono ended in a tie and qualified for the play-off. Usually only the two higher-ranked players in a multiple tie make the play-off, but Hane and Kono had the same rank. They played each other on April 8, with Kono (B) winning by resignation. Hane either had the sole lead or shared the lead nearly all the way in the league, but he stumbled at the end. Kono’s win continues his superb form: his record this year is 13-1. 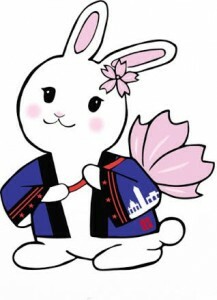 Kono will now play Shibano on April 10. The latter was seeded into the second stage of the play-off because of his higher ranking in the league. At the other end of the league, there are no play-offs for retaining your place. Yamashita, Yo, and Ichiriki all finished on 4-3, but Yamashita’s number one ranking gave him priority over the other two. This was a tough result for Ichiriki: one game made the difference between tying for first and losing his place in the league. Mateusz Surma 2P from the European Go Federation (EGF) defeated Andy Liu 1P in the first round of the 2019 Transatlantic Professional Go Team Championship on Sunday, April 7. The game was played live and broadcast by the AGA on Twitch with host Nick Sibicky and commentator Eric Lui 1P. More than 12,000 viewers observed the nail-biting game that lasted more than three hours. In early mid-game, Surma’s mis-steps in the upper right corner led to Liu’s advantage, building strong shape in the center. However, Surma persisted, collecting points on both the right and left sides, and perfectly timing a deep invasion into Liu’s territory on the lower side. The invasion led to a complex fight when both players were in byoyomi. A series of ko fights created huge exchanges that were much favorable for Surma, and Liu resigned. The AGA’s next player will be Calvin Sun 1P, and Surma will be playing with Black in the next round, scheduled for April 14, 14:00 EDT on KGS in the Transatlantic Pro Team room, and broadcast live on Twitch. All videos of the live streaming will also be available on YouTube. The National Go Center held its first ever two-day tournament on March 30-31. Forty two players turned out including contingents from Stonybrook University and the Feng Yun Go School. 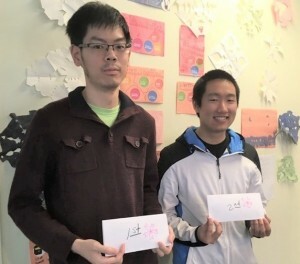 First place at 5-0 — and still undefeated in NGC tournaments – went to Eric Lui 1P, followed by Justin Teng 6D at 4-1. The cherry blossoms are at peak bloom in DC this week. All 4- and 5- game winners are receiving two tickets for the upcoming Sakura Matsuri festival on Saturday, April 13th, and 3-game winners are getting one ticket each. Sakura Matsuri is an annual festival on Pennsylvania Avenue in DC and the NGC will carry on the tradition of staffing a booth and teaching go to all comers. All volunteers also receive a free ticket to the event. If interested in volunteering contact NGC Outreach Coordinator, Patrick Sun (patrick.sun@nationalgocenter.org). The NGC is also fundraising by selling tickets to the festival. The tickets are $10 and can be purchased using this link, which will credit the NGC. 3-game winners: Joey Phoon (2K); Fengqi Wen (2K); Jack de la Beaujardiere (6K); Gurujeet Khalsa (7K); Noah Mullinax (7K); Amber Boyden (15K). 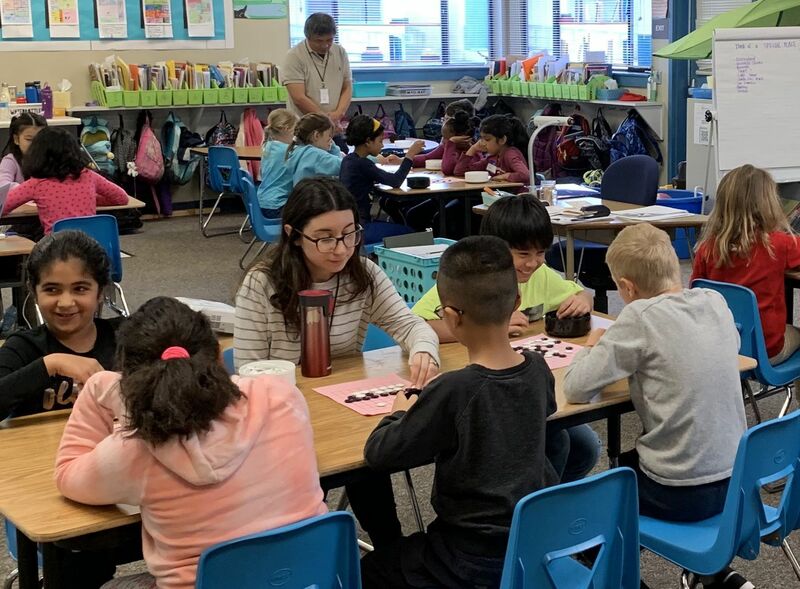 Third graders at Sedgwick Elementary School, in Cupertino, CA, learned how to play go at their school’s annual Discovery Day on March 26th. As in previous years, the school invited many presenters to teach various kinds of fun activities, such as fencing, YoYo, and robotics. Wenguang Wang, Hongya Qu, and Yi Luo, from The VMware Go Club and Santa Clara Youth Go Club, volunteered as presenters and hosted the “Learn to Play Go” session for about 100 third-graders. The same session was presented to the entire third grade (4 classes of students). Students learned the rules of go and played a few games on 9×9 boards. They enjoyed the session, especially those who won! Story and Photo by Wenguang Wang. 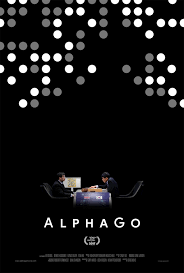 Members of the National Go Center will provide a go demonstration at this Thursday’s screening of “AlphaGo” at the AFI Silver Theatre in Silver Spring, MD. The demo starts at 6:15p, and the screening begins at 7:15p. If you’re interested in participating in the demo, contact Outreach Coordinator Patrick Sun; all volunteers receive a free pass to the movie. Dr. Benjamin Bengfort, data scientist at PingThings will introduce the absorbing documentary, which chronicles Google’s DeepMind team as it prepares to test the limits of its rapidly evolving AI technology against one of the top professional go players in the world. Members can always update their current chapter through the AGA Membership Manager if they have moved. Raleigh, North Carolina is often called the southern part of heaven. We’re blessed with a comfortable climate, beautiful natural scenery, honest hard-working natives, outstanding universities, progressive businesses, lots of wonderful immigrants, healthcare workers, scientists, writers, and a sprinkling of Go players. 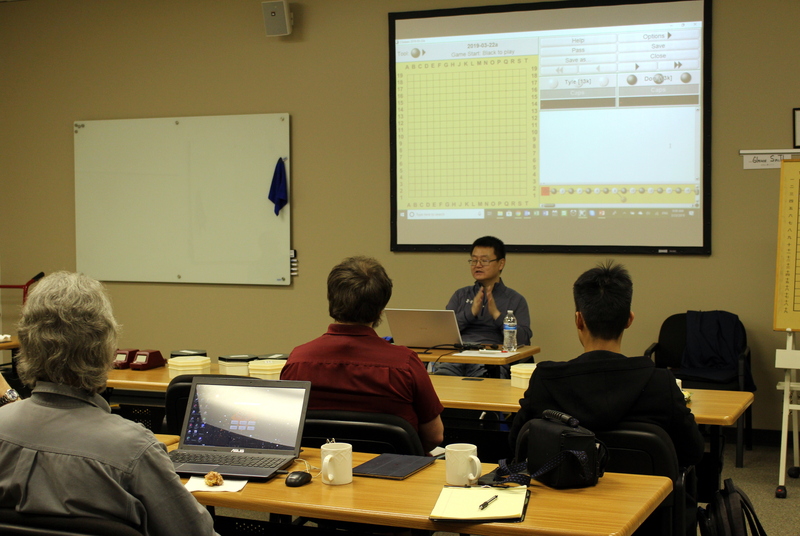 We’re also fortunate to be within traveling range of Maryland based Yuan Zhou, one of the nation’s leading Go teachers. Laoshi (teacher) Zhou conducted another of his invaluable workshops for us last weekend, and attendees were happily educated in this finest of arts. 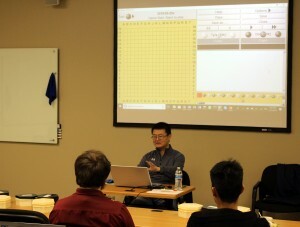 In addition to the usual game reviews, which were very beneficial in themselves, teacher Zhou presented two lectures on games from the recently concluded 2019 LG Cup. Describing the young players Yang Dingxin and Shi Yue as “Dragon Hunter” and “Tank Driver” helped us understand the styles of play each player employed, and some of the deeper foundations of the game. Both games were very interesting and shifu Zhou’s explanations were enlightening. Laoshi Zhou provided much helpful advice throughout the workshop, often presenting concepts in the guise of folk stories, making them easier to remember, such as the bear and the cornfield, and dragon lover Gong Ye. Yuan Zhou also provided an very helpful review of the 3 3 point invasion, explaining the benefits, consequences and history of this trendy move. A prolific Go author, laoshi Zhou has written a number of books on Alpha Go, Go Seigen and the 3 3 invasion, published by Slate and Shell. We were taught much, learned as much as we could, ate well, slept just enough and enjoyed the modern meeting facility arranged by Dale Blann, one of our club members. I can’t wait until we do it again! The Seattle Go Center is pivoting to teaching the science of playing Go, instead of the art of Go playing, according to Program Manager Mike Malveaux. “Our latest class, held on Wednesdays, is on programming computers in Python with Artificial Intelligence / Machine Learning techniques, loosely following Deep Learning and the Game of Go by Max Pumperla and Kevin Ferguson.” Operations Manager Brian Allen notes that some of the Go Center instructors have impressive scientific credentials. 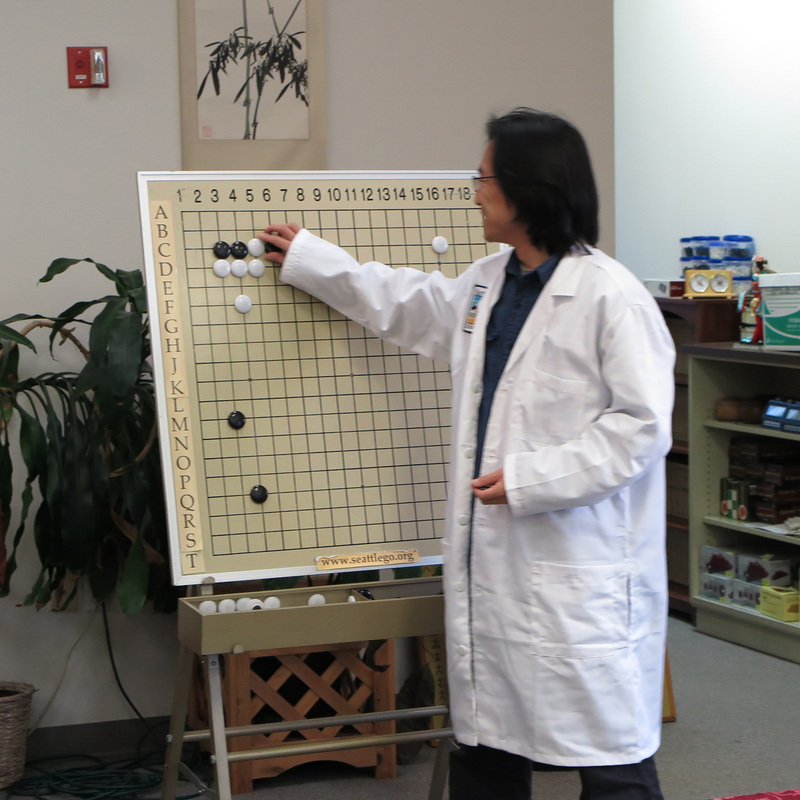 For example, Yue Zhang has a Phd in Paleontology, in addition to being a 7 dan Go player. 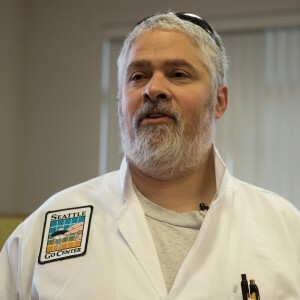 To emphasize their connection to science, all teachers will be required to wear lab coats with Seattle Go Center logo patches. “In the age of AlphaGo and Leela, our members expect this,” he reports. Visiting instructors will be allowed to wear ethnic costumes, such as two-piece business suits, if they want. - report by Brian Allen. photos: (left) Mike Malveaux by Brian Allen; (right) Yue Zhang by Mike Malveaux. The weekend of March 22-24 was a busy time for the members of the San Diego Go Club. On Friday and Saturday, they manned several tables at the annual Cherry Blossom Festival at the Japanese Friendship Garden in Balboa Park. Thousands streamed into the garden and many found their way next to the koi pond and under the blooming purple wisteria flowers where SDGC members were teaching and demonstrating go. Several new members were added to the club’s roster. On Sunday, the go club hosted at the San Diego Chess Club the eighth annual San Diego Go Championship. There was a record turnout of 65 competing, with players coming from Vermont, Arizona, and all over Southern California. Ten players, including two past champions, entered the Open Section to compete for 2019 title of Best Player in San Diego. When the top-rated 9.9-dan player lost in the first round, the title was up for grabs. 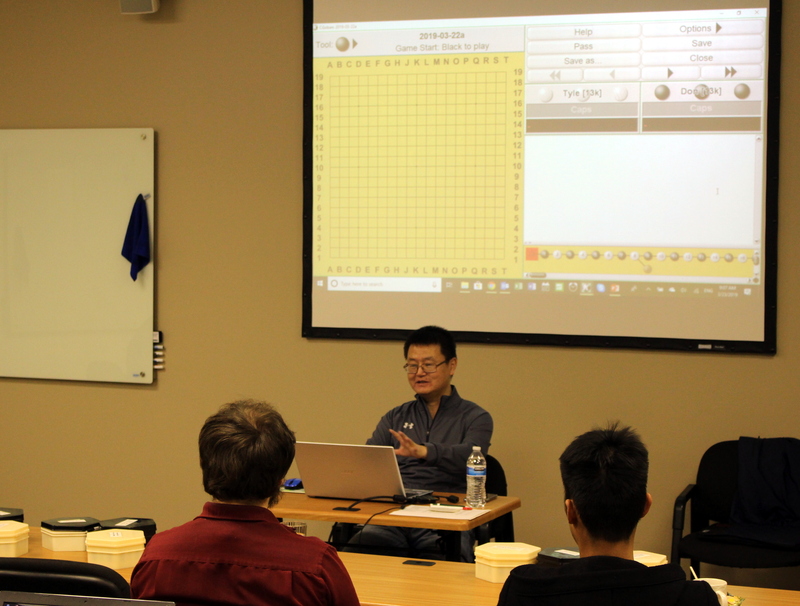 After four hotly contested rounds, the Open Section ended up with a 4-way tie (3-1 records) for First Place: Hongkui Zheng 6d (2019 Champ), Xinyu Liu 6s, Yi Wang 6d (2018 Champ), Mark Lee 6d (2016 Champ). While all four players shared the combined 1st-3rd place cash prizes totaling $600, Hongkui Zheng was declared the champion based on the GoClubs.org tie-breaking system and awarded the trophy. 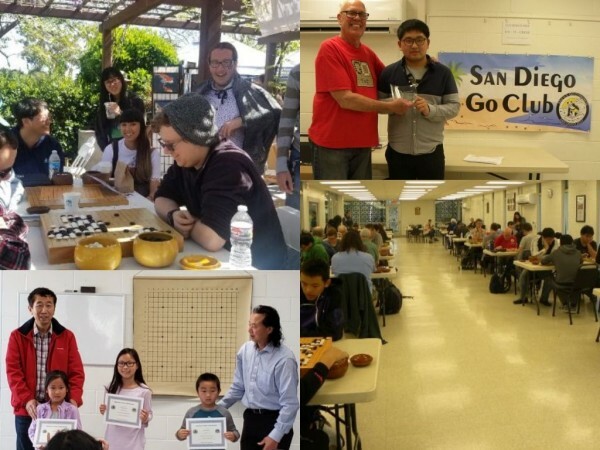 Thirty-five more competed in the Handicap Sections and an additional twenty youth played in a 5-round 13×13 competition run by Chinese professional Hai Li and the California Go Association. Dan/High Kyu: 1st: Christophe Humbert 2d; 2nd: Kevin Yang 1k; 3rd: Peter Schumer 2k. Single-Digit Kyu: 1st: Arunas Rudvalis 6k; 2nd: Warren Andrews 6k; 3rd: Elias Klingbeil 4k. Double-Digit Kyu: 1st: Lucia Moscola 15k; 2nd: Pasco Kwok 12k; 3rd: Andy Zhou 12k. 20+ Kyu: 1st: George Spellman 23k; 2nd: Enzo Moscola 26k; 3rd: David Saponara 24k. 13×13 Youth Competition: 1st: Addison Lee 20k (Girls’ Champion); 2nd: Angelino Zhao 18k; 3rd: Evan Tan 27k (Boys’ Champion). The San Diego Go Club is now looking forward to hosting the second annual California Go Championship in the fall. Hopefully, Calvin Sun US 1P will return to defend his championship. 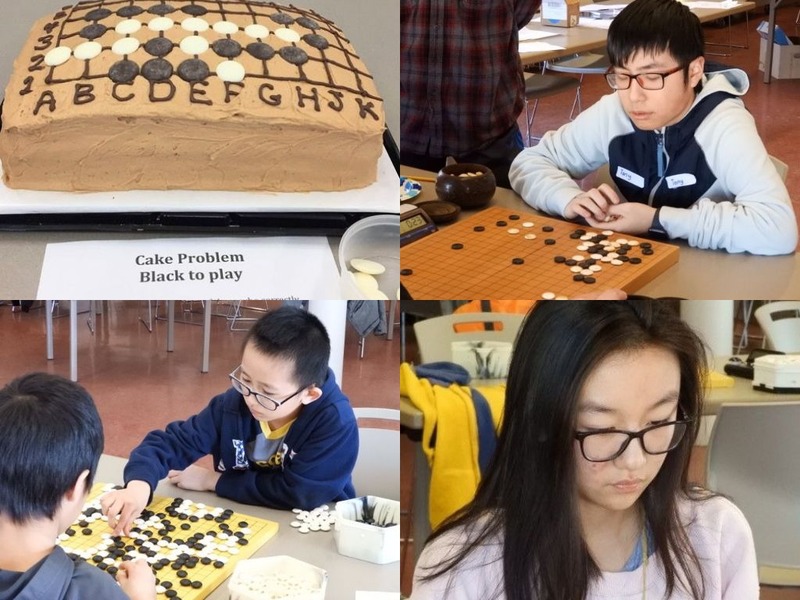 The Syracuse Go Club hosted its 12th annual Salt City Tournament on March 23; thirty-seven players participated, one shy of the tournament record. Local high school senior Tony Tang 7d (top right) was the only four-game winner in the tournament’s A division and claimed the $100 1st place prize, while Cornell University students Jiuheng He 5d and Shao-Ting Ho 4d took home the prize money for 2nd and 3rd place, respectively. Thirteen-year-old Liya Luk 2k (bottom right), of Syracuse, swept all four of her games and won the B division. Syracuse high-school student Sheng Yuan Lin 5k and Buffalo resident Patrick Wesp 7k both had 3-1 records and finished in 2nd and 3rd place in that division. Jimmy Li 22k (bottom left) was the C division’s only 4-0 winner, while Casey Beach 13k and Benjamin Braun 21k each won three games and finished in 2nd and 3rd place in the division. Allen Noe served as tournament director, and organizer Richard Moseson’s wife Chris once again made the tournament’s traditional Problem Cake (top right), correctly solved by a majority of the players (black to play). Free refreshments for all were provided by Syracuse players, and at the end of the day, every player was able to select a new go book as a prize. Pictures from the tournament can be seen here.